Mike teaches many of the great variety of playing styles developed in the South during the nineteenth and early twentieth century. Each piece is played through, followed by comments on style and a slow split-screen repetition; and the many different banjos are shown in close-up. 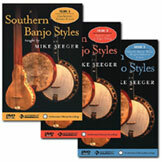 The enclosed booklet includes tabs, a banjo discography, how to choose and set up a banjo, and much more. Based on Mike's Smithsonian Folkways CD (see above). See below for details on each volume.